Oh my gosh! It has been so long since I painted with watercolours and I really missed it! I decided to take a break in the afternoon (after freelancing in the morning) to just paint and design a new fish today. It's been ages!!! 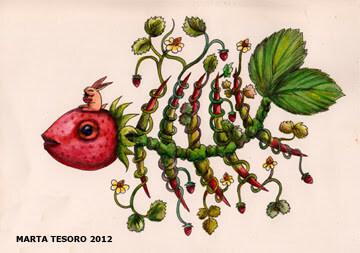 I want to do a series of "berry fish" and submit them to an art exhibition in a couple of weeks so this is probably the only one of the series you'll see online. The requirement for this exhibition is any medium but must not be bigger than 30x30x30 cm including the frame. Hopefully I can make time to create more of these guys. Would be cool. I managed to do the line work of my Blueberry fish today and am hoping to find the time to paint it tomorrow. Would be good. looks fabulous; i love the idea of berry fish. hopefully you’ll share some snapshots from the exhibition?